The Scoville scale is a measurement of the spicy heat (or piquance) of a chili pepper. The number of Scoville heat units (SHU) indicates the amount of capsaicin present. Capsaicin is a chemical compound that stimulates chemoreceptor nerve endings in the skin, especially the mucous membranes; pure capsaicin has a Scoville rating of 16,000,000 SHU. The scale is named after its creator, American pharmacist Wilbur Scoville. His method, devised in 1912, is known as the Scoville Organoleptic Test. The modern commonplace method for quantitative analysis uses high performance liquid chromatography, making it possible to directly measure capsaicinoid content. 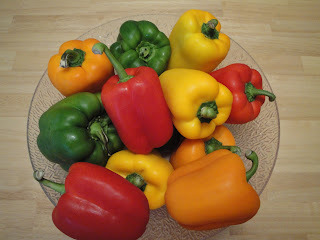 There are so many different peppers. Here is a list of different types of peppers and the Scoville ratings of peppers. Thanks for the run down on the heat levels! Trinidad peppers sure bring it with the heat! This would be good to print out or scan and take shopping. Pepper heat ratings always confuse me. Thanks for demystifying them! Christine, I wish I would have had this list when I tried a habanero salsa last weekend, ha! (I knew they were hot, but not THAT hot!) Thanks for another informative post! This is very informative Christine! Thanks! Love this ... thanks for posting!